Update 6/4/2013 - This deal is back up for grabs for a third time as an Amazon Gold Box Deal of the day. Even though a lot of time has gone by since this was first posted, this is still a good deal at $93 because of the two included L-Boxx cases. Update 1/8/2013 - Amazon has brought this deal back as a Gold Box for today. Get it while you can, you don't want to miss out. 11/23/2012 - We don't see deals like this very often, but this package deal that Amazon is currently running might be too good for you to pass up. I am even thinking about picking up the deal because it is that good. 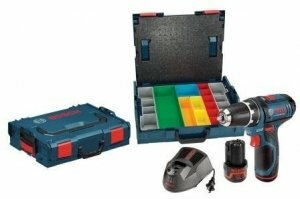 For under $95 you can get the Bosch PS31-2AL1A which includes the Bosch 12V ⅜-Inch Drill Driver (plus one batteries & charger), which in this case, uses the L-BOXX as its carrying case. This kit also includes an additional L-BOXX1A, and could be used to sort drill bits, screws, fittings etc. And if you are unfamiliar with the L-BOXX system, it s a stackable modular storage system that Bosch sells in a few sizes. Just buying the two L-BOXX cases alone would add up to almost $95, and the PS31 kit with two batteries sells for $125. You are basically getting a free drill with the purchase of the L-Boxx cases.